Located under the suntrap Round House the silo housing TB3 is the farthest from the Tracy home. The method of approach differs accordingly but the few minutes longer taken by the astronaut provides time for a full briefing on the mission as well as the necessary preflight preparations required for launch. Like the others, the launch bay is compact and businesslike, function being the keynote of design. Alan is the usual pilot of TB3 but John is also familar with the craft and uses it regulary when changing shifts on TB5 with Alan. Whilst on board the crew and passengers are protected from meteor showers and cosmic storms by the twin walled hull around the cabin area and the accomodation quarters. TB3 is well equipped for space rescue missions. 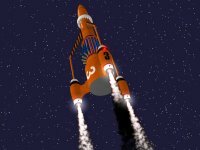 The atomic pile generators, particle accelerator propulsion and life support systems are capable of sustaining TB3 and its crew for the lengthy space voyages that must be endured. 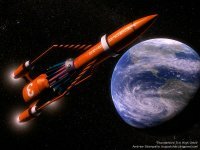 Maneauvreablity in space is provided by retro rockets, pitch-and-yaw jets and a centrally mounted fly wheel assembly that allows economical course corrections to be made without burning valuable fuel. Sophisticated sensors, accelerometers, computers and communications ensure that Alan or John are fully aware of conditions inside and outside the craft. Docking with TB5 is fully automated as is re-entry, descent and the vertical landing back into the silo.